Acta Stomatologica Marisiensis is an official Journal of the University of Medicine and Pharmacy Tirgu Mures, Romania, and it is published twice a year. The Acta Stomatologica Marisiensis Journal is an international journal dedicated to publishing peer-reviewed articles about dental medicine. The themes covered by the journal include all the fields of dentistry, within a broad spectrum of disciplines and therapeutic areas, including, but not restricted to oral health, prosthetic dentistry, endodontics, paedodontics, orthodontics, oro-maxillo-facial surgery, oral pathology and dermatology, implantology, dental materials, digital dentistry, nanotechnology and materials or medical engeneering. The role is to inform its readers of ideas, opinions, developments and key issues concerning dental medicine, stimulating interest, debate and discussion amongst dentists and those of related disciplines. 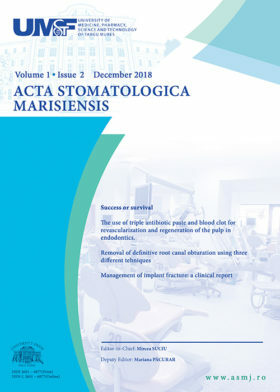 The Acta Stomatologica Marisiensis Journal has institutional support from the University of Medicine and Pharmacy Tirgu Mures, the owner of the journal.